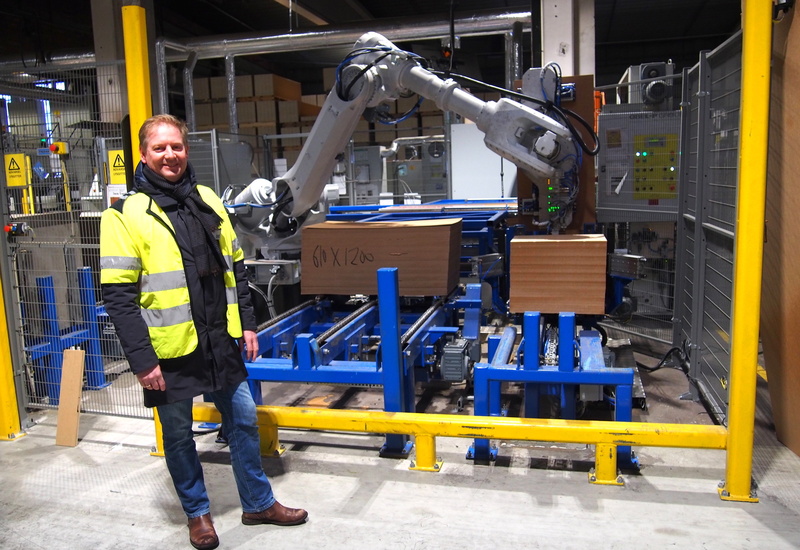 Øystein Netland, Director of Business Development at Tratec Norcon, proudly shows the robot cell delivered to Huntonit. Tratec Norcon has delivered its first complete robot solution. “This is a milestone for us and the result of a new strategy for 2018-2020. 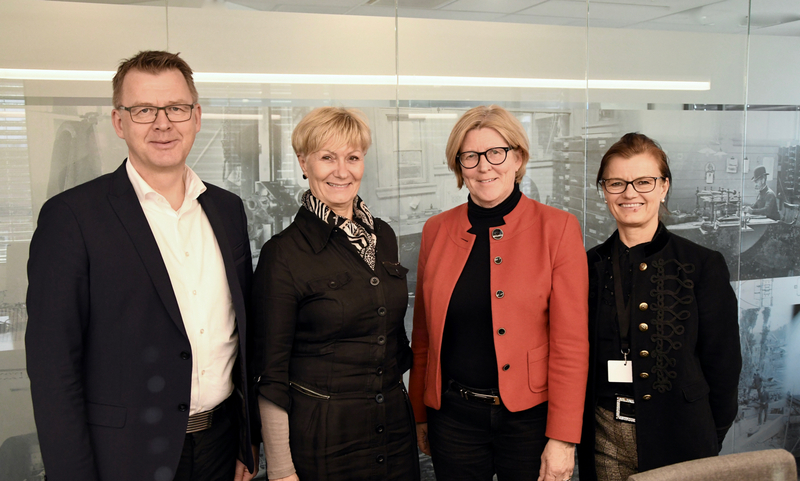 Our goal is to be a preferred total supplier of robotized machine solutions for production optimization in Southern Norway,” says Bent-Ståle Johansen, CEO at Tratec Norcon. The technology company based in Vennesla has a strong track record for industry automation and robotics, but has never before been responsible for the design, delivery, installation, commissioning and testing of a complete robot solution. Johansen says the time was right. “In coming years, many large and small companies in Southern Norway will need and demand robot technology. Thus, we are looking to utilize our existing competence to position ourselves in this market,” he says. The first order came literally from across the street. Neighboring company Huntonit asked Tratec Norcon to automate the packaging process of its fiberboard production. “The machine solution for Huntonit’s production line is a standard ABB industrial robot from our partner Robot Norway. In addition to programming the robot, we have been responsible for system integration, that is, the robot cell itself,” Johansen explains. The robot cell replaces what was previously physically heavy and monotonous work for Huntonit employees. The cell runs around the clock and is able to pack 21 products in different formats. “In terms of both production optimization and HSE, this is a solution that will be in demand in years to come, especially in the process and wood processing industry,” says Øystein Netland, Director of Business Development at Tratec Norcon. In addition to better working conditions for Huntonit’s employees, the robot cell helps the company build new competence, it increases production efficiency and ultimately produces greater output per unit of time. Thus, Huntonit will be better equipped to meet tougher competition. 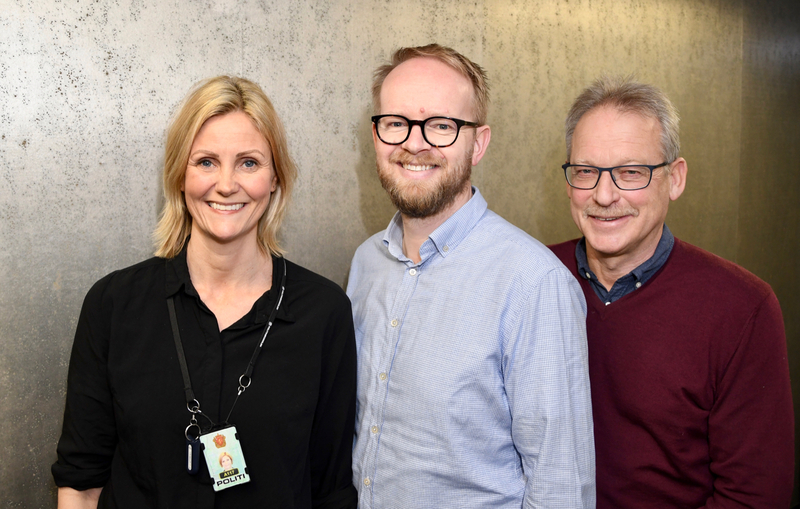 In January, Tratec Norcon’s achievements in robotics, earned the company the distinction “Business of the Month”, presented by the Confederation of Norwegian Enterprises in Agder (NHO Agder). “Through collaboration between companies in our region, Tratec Norcon has succeeded, not in talking robotics, but actually implementing robotics. 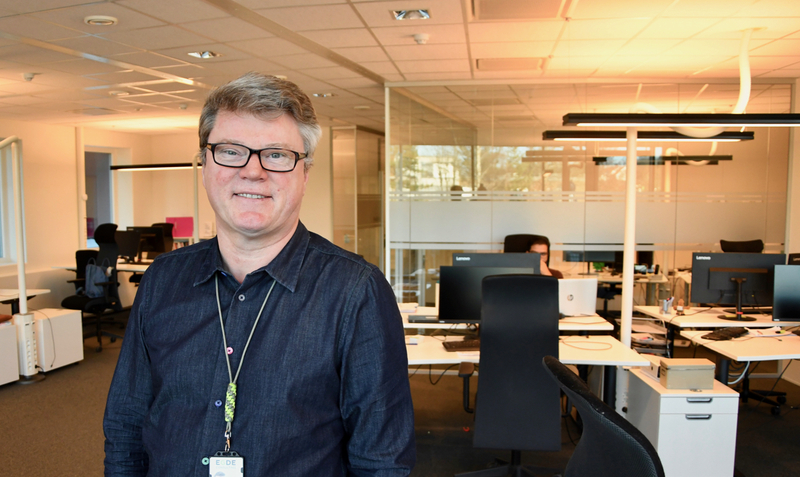 The company has developed a competence that creates new business and also contributes to value creation both in Tratec Norcon and other enterprises,” says Trond Madsen, NHO Agder Senior Advisor. 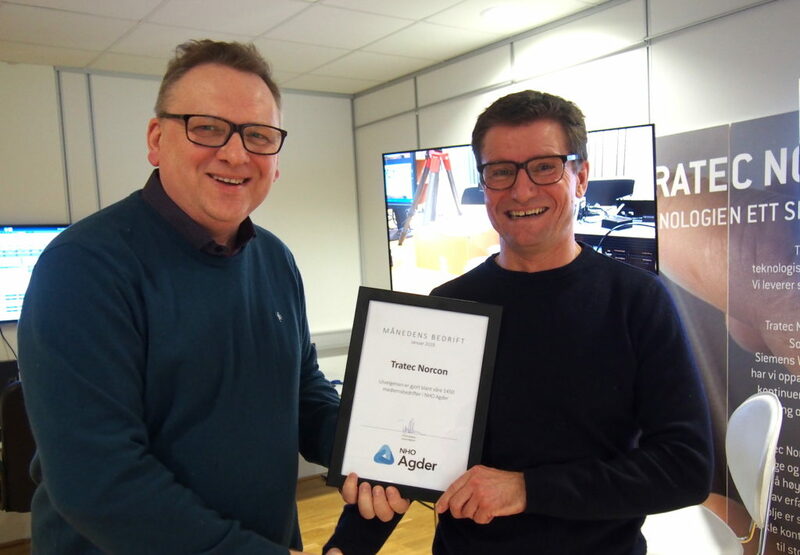 Trond Madsen (NHO Agder, left) presented the award “Business of the Month” to Bent-Ståle Johansen, CEO at Tratec Norcon.